Saturday, I braved the back garden. The big kitchen garden. The overrun, weed-infested kitchen garden. The garden spitting out hot peppers faster than I can preserve them. The garden with spotty cucumber vines creeping from their beds and escaping their trellises to trip me in the paths. The garden with its initially pristine, perfectly planned herb beds, lovely little angel wings designs, now smothered with crab grass. Obviously, I've avoided the big kitchen garden for awhile. Now that I've written those words, I suppose they're not absolutely true. I did clear out three beds recently for fall crops, adding transplants and seeds. But whenever I thought about tackling the front three beds, where the peppers and cucumbers continue to produce, I walked away. The beds might be ugly, but they're productive. And that's what matters. But the herb beds needed attention. Desperately. Not only were the beds an eyesore, but I lost several plants under the carpet of weeds. I couldn't find them. Unsure whether they died or were hiding in shame because of their surroundings, I strengthened my resolve and set to work. Today, my knees are not happy. But, as I pruned and pulled, uncovering the design and freeing the plants and paths, I marveled at the surprises I found.
) before—but it's never been this prolific. Obviously, it enjoyed my neglect, and I love it for its lack of neediness. I especially adore that it's embracing autumn, with the foliage changing from green to burgundy. Next year, lemongrass may take center stage in the front yard, interplanted with ornamentals. The texture and autumn color provide a pretty backdrop for shorter perennials and annuals. Plus, it's edible—and you know how I feel about incorporating edibles into the front yard! The sharp, citrus flavor of lemongrass is often used in Asian cooking. In fact, I feasted on delicious P.F. Chang lemongrass chicken dumplings last week, while waiting for the Toyota service department to finish the Prius' 5,000 mile check-up. Besides its culinary appeal, lemongrass is used in the perfume industry. Cut a stalk, and you'll understand why. Lemony fragrance infuses the air around you. A relative of citronella, it's a natural mosquito repellent. Lemongrass is also heralded as a calming medicinal herb. Lemongrass tea is traditionally consumed to relieve stomachaches. It's also used to help alleviate cough, fevers, high blood pressure, and exhaustion. Of course, if you plan to use lemongrass or any herbs medicinally, consult a healthcare practitioner. I'm not a healthcare practitioner. I just want to gorge on lemongrass chicken dumplings. Lemongrass is very easy to grow. My lemongrass started as seed, germinating in the greenhouse last spring. Plant seeds in soilless seed starting mix, either in trays or pots, and keep the mix evenly moist. Do not allow the mix to dry out, but also be careful not to drown the seedling. Additionally, you'll want the soil temperature to be at least 60 degrees when propagating seeds. Transplant the seedling outside when all danger of frost is past. Because lemongrass is considered a tropical perennial, you'll need to overwinter it inside for zones less than 9; otherwise, consider it an annual in cooler climates. Can you see the tiny lemongrass seedling I planted in front of the middle bed this spring? Look at how tall and lush it grew--even with serious neglect. Now, that's my kind of plant! 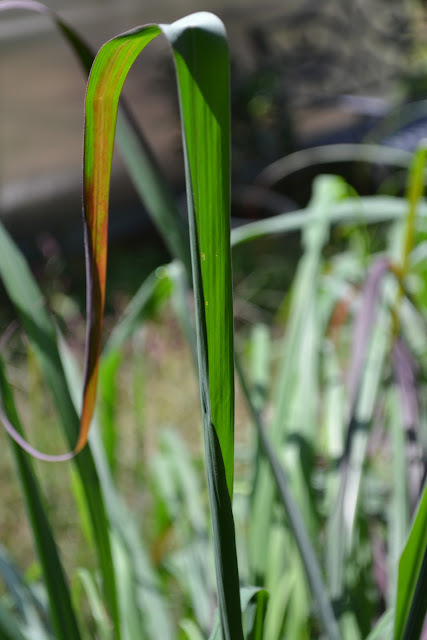 Another method for growing lemongrass is root division. Propagate by digging the entire plant, dividing the roots into two or three pieces. Replant at the same depth as originally planted, trimming the leaves to three or four inches tall to reduce the amount of water lost through leaves. 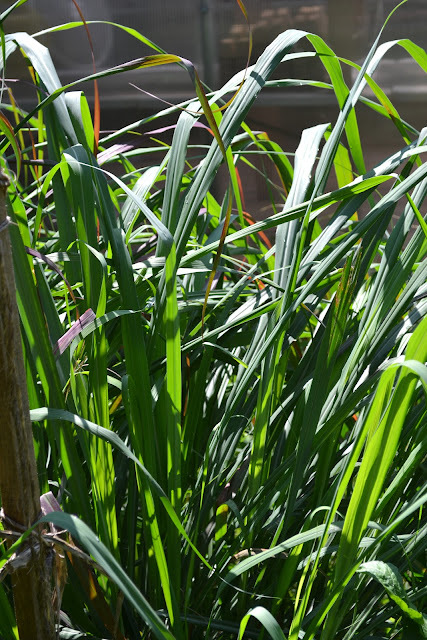 Lemongrass requires full sun and rich, well-drained soil. 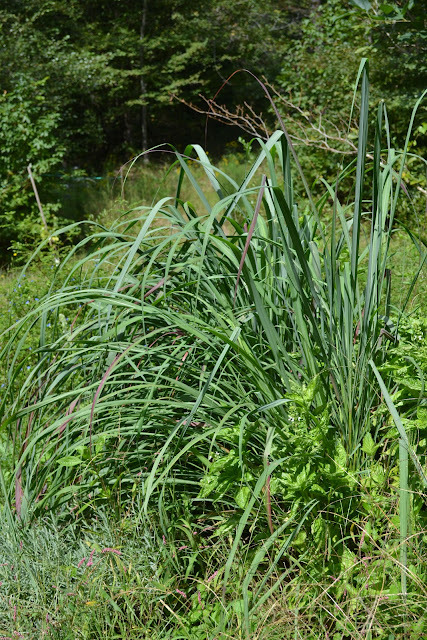 Because lemongrass can grow up to five feet tall and four feet wide, space plants accordingly in the garden. Lemongrass can also be grown in containers, which makes it easier to move inside during winter. However, add a good organic, nitrogen-rich fertilizer, like diluted fish emulsion, to the container monthly. It will stink for a day, but lemongrass needs nitrogen. While lemongrass is rarely bothered by pests, cats do like to snack on the leaves—and sometimes dig up the plants. However, Oreo and Sammy haven't bothered our lemongrass. Honestly, the first time I grew lemongrass—I had no idea how to harvest it. The stalk of the plant is used in cooking, while the leaves are used for tea. Cut the older outside stalks at the soil line. Wait to harvest until the plant is at least a foot tall and the stalks are approximately half an inch thick. When preparing lemongrass for culinary use, use the lower white portion of the stem. Finely slice the stem crosswise to avoid a tough, fibrous texture in the meal. You can also bruise the stem to release the flavor, adding the entire stalk to the dish, then removing it prior to serving. Stir fry, soup, Thai and Vietnamese dishes, pasta, fish, and veggies...all benefit from the addition of lemongrass. Lemongrass can be dried or frozen, but honestly—the scent and flavor of fresh lemongrass can't be beat. My hands smelled amazing after harvesting lemongrass. Be warned, though—the leaves are sharp! I'm now sporting an inch-long paper-cut-like wound from a lemongrass leaf. OK, maybe I bought it more for sentimental reasons than a practical get-a-dinner-on-the-table-during-the-school-week reference. 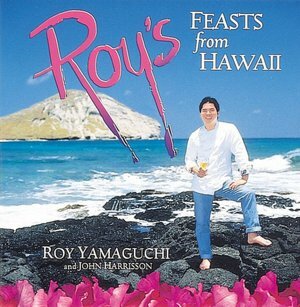 Still, it's a gorgeous cookbook...with a delicious recipe incorporating lemongrass. Combine all the crust ingredients in a mixing bowl. Coat one side of the salmon with the crust mixture approximately 5 minutes before cooking. Heat a large skillet over medium-high heat. Coat the crusted side of the salmon with the canola oil and sear, crusted side first, for about 1-1/2 minutes. Turn over and sear the other side for about 1 minute longer. To prepare the watercress-ginger sauce, squeeze the ginger in a garlic press and place the extracted juice (about 1 tablespoon) in a mixing bowl. Discard the ginger pulp. Bring a saucepan of water to a boil, remove from the heat, and blanch the watercress for about 15 seconds. Drain. Mince the watercress leaves and mix them with the ginger juice. Stir the watercress into the Beurre Blanc and keep warm. To prepare the Beurre Blanc:Combine the wine, wine vinegar, lemon juice, and shallots in a saucepan and bring to a boil over medium-high heat. Reduce the liquid until it becomes syrupy. Add the cream, and reduce by half. Turn the heat to low and slowly add the butter, mixing carefully (do not whisk), until the butter is thoroughly mixed into liquid. Do not let the mixture boil—the ingredients will separate. Season with salt and pepper and strain through a fine sieve. Transfer to a double boiler and keep warm. To serve place a salmon steak, crusted side up, in the center of each plate and ladle the Watercress-Ginger Sauce around the salmon. Garnish with watercress sprigs and pickled ginger. And there you have it...just your typical Monday night meal, infused with the delicious taste and aroma of your homegrown lemongrass.